Editor’s Note – Though Noupe is affiliated with Smashing Magazine, this piece is strictly the opinion of the author. When I was first contacted with a reviewer’s copy of The Smashing Book #3 I was both excited, and a little bit terrified. I was extremely excited to get a peek at the book before its release, and to get my hands on the content I had eagerly been anticipating since the project was announced. I was a bit terrified because the book’s theme of ‘Redesign the Web’, was not only one I had written on in the past, but after redesigning our own sites not long ago, I was afraid to find out that we had done it all wrong. All the fears aside, with the first two books as part of our design reading library, I had no doubt that this third tome would live up to its predecessors. And I would not have to get too far into the book to be proven right. As I dove right into the book’s first chapter on The Business Side of Redesign, I was inundated with so much practical, applicable advice on how to present a redesign project to clients and how realigning is the much better route. Which was nice to read after the initial fears of finding out we had redesigned our own personal sites incorrectly had surfaced, but as big believers in realignment, the book was somewhat reassuring. This was just an added bonus. As the chapter went on, I found myself glad that I was reading a digital copy. Had it been an analog version, I would have been running through highlighters by the dozens. Nearly every page presented me with great information too mark and make note of. This trend did not stop at the first chapter’s end either. The entire book proved to be packed of notable advice from the crack crew that Smashing assembled for the team. And every single one of them, brought their ‘A’ game. If you haven’t seen the breakdown of the authors and reviewers for each chapter, then you really are in for a treat. It reads more like a web design and development dream team than an actual book roster. But when you look at all that went into the book, the budget, time, and the expertise, you begin to understand just how fantastic a book it has the potential to be. And with each chapter I took in, those expectations of the book’s potential were constantly exceeded. As previously mentioned, the first chapter deals with the business side of the website redesign, which is a really great introduction because it hints that the further chapters beyond it will help complete the picture, and that all aspects of the redesign will be handled. And that is one of the best things about the book. It does such a good job ensuring that you get the whole picture. Each of Smashing Book #3’s 11 chapters goes through all facets of a redesign, from beginning to end, with a fine tooth comb. 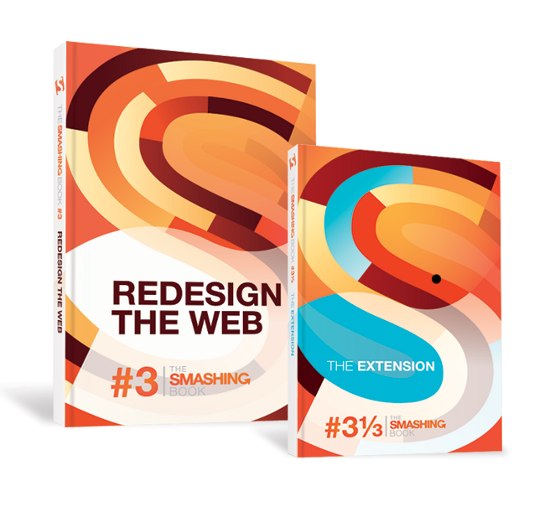 No detail is overlooked, and if you get your hands on ‘The Extension’, Smashing Book #3 1/3 you also get a case study of the Smashing Magazine redesign to show all of the thoughtful advice applied in a real world setting; which sounds like a very intriguing companion read. Admittedly, I have not had the chance to check that out yet. One of the most information packed chapters that I was really surprised by, was chapter 7 ‘Designing for the Future Using Photoshop’ from Marc Edwards and Jon Hicks. The chapter was as unexpected as it was informative, and really grabbed my attention. Not that there were any chapters where the content felt lacking, but this chapter just seemed to really overflow with its detailed dissection of Photoshop. And in a completely accessible way. Which is actually one of the highlights of the entire book. The accessibility it provides to the subject at hand. 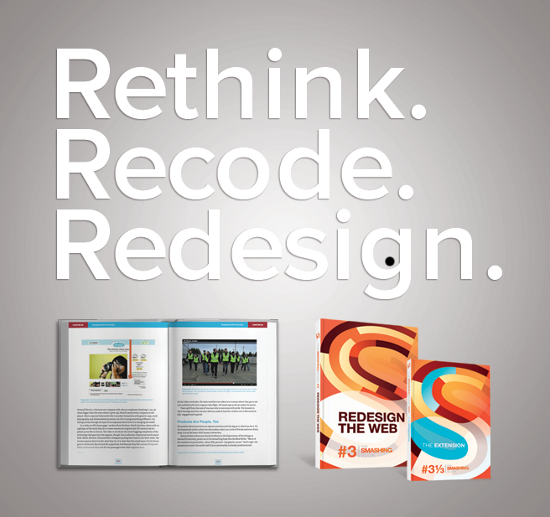 Redesigning the web. No matter what element you are tackling, or if you are in charge of the whole thing, all that you need to steer your redesign project towards success is contained in the chapters of this book. And with information geared towards all parties involved, it really should be required reading for anyone working or hiring for a redesign. I can see it being something of a survivor’s guide to future projects. Always within reach. Chapter 8, Redesigning With Personality from Aarron Walter and Denise Jacobs, contains one of my favorite sections that really challenged me to think of websites in a different way. Products Are People Too did a good job of taking a complex issue, and boiling it down into a very digestible manner. We are often told that we need to build trust through brands and design, and this chapter delivers the goods on cementing that trust by adding in personality. From the chapter’s first line, “Redesigning a website can be the seven-layer taco dip of hell” I was sold. Because I knew that feeling. The last chapter I will talk about specifically before I move on, was Chapter 10 Workflow Redesigned: A Future Friendly Approach by Stephen Hay and Bryan Rieger, which was another example of challenging me to approach future projects differently. With responsive web design being an important aspect of any web design project these days, this chapter comes in and lays out a plan of attack that I am sure readers will be adopting for themselves. It will certainly at least get people talking about it. Just like Smashing Magazine and the team behind it, Smashing Book #3 is loaded with personality and a lot of charm. From the title of the book being spelled out through the chapters colorfully illustrated drop caps to the playful nature’s of many of the book’s authors, the book is as much fun as one would expect. They have even said that there are hundreds of animals hidden in the book’s illustrations, so that you can go on a bit of a scavenger hunt to see if you can find all 623 of them. Overall, the journey it takes you on from beginning to end is entertaining, well constructed, highly communicative, and as mentioned challenging. It doesn’t just make you want to be a better designer or developer on your projects, it gives you actual steps to take and ways to accomplish it. And where some books tend more towards theory, with so many talented experts coming to the table to offer real world advice and examples, this book takes the theories and arms you for putting them into practice. I thoroughly enjoyed the Smashing Book #3 and would recommend it for anyone in the field or with a site of their own. It gives great insight into where the industry currently stands, and how to take on these often monster projects with a bit more ease and confidence. Are you planning on grabbing a copy, or do you already have one on the way? What entices, or intrigues you the most about this newest Smashing book? About this time last year I was looking for inspiration and I turned to Smashing Book 2. I was reinvigorated by all of the fresh information and perspectives in the book. With the wealth of talented writers, I expect nothing less from #3. My copy shipped last week so it should be in my hands any day now and I can’t wait to read it and like you, take plenty of notes. I’m glad to read all of the positive and enthusiastic response to the book thus far, and frankly I’m not surprised by that. The Smashing Book #3 is so good! The book is packed is practical advice and is written in a clear, fun engaging way. I bought the e-book bundle and I found myself highlighting so much as well. Would recommend it to anyone involved in web design. I received my copy on Saturday and have had a quick flick through it. Content looks great. I have the previous Smashing Books and found them very useful and still refer back to them. I am sure Smashing Book #3 will be the same. The good review certainly indicates that. What’s the added value over the other 2? Do the books stand on their own, or is it better to have the other 2 as well for the full picture. Are things being repeated over the books? How well does it stand against time? Sorry to disappoint, Maurice, but I didn’t have anything negative to say. I tend to try and view things with a more positive lens, so that’s the way it came out. There was so much good to discuss and that stood out, that’s what I took away from the book as I sat down to review it. Actually, if you read the review fully, then all of your questions are answered. It’s a completely different book than the others, as this examines specifically redesigning. So yes, it does stand on its own because this book is themed in that direction. There is no repeat, because the context is wholly modeled around the books theme. The review mentions the future-proofing coverage which should give the book the ability to stand the test of time, but as with all things, only time will tell. It seems to do a great job preparing us for working in this dynamic a field, so I would say yes. Lol, you are certainly entitled to your opinion, as I am mine, which I assure you that is what this is. Not sure how I could make it more authentic than giving my honest assessment of the book. The Smashing Book #3 is so AWESOME! 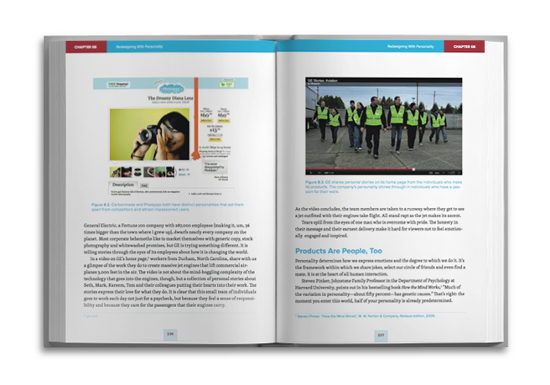 The book has practical advice and is written in a clear, fun engaging way. 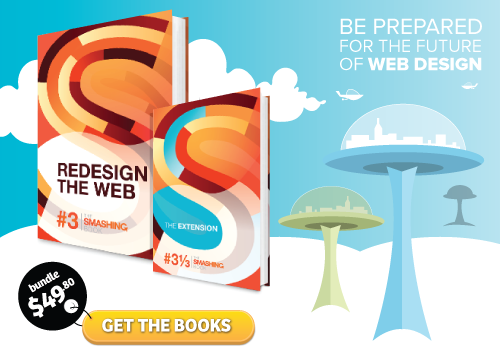 i read “The Smashing Book #3” it is a invaluable resource for Web designers or they are looking “Responsive Web design”.I found myself highlighting so much as well. Thanks a lot!! To all the Authors for their novel approach and time.